The Amigo Petition Jersey cooler is made of brushed polyester and has a classic design. 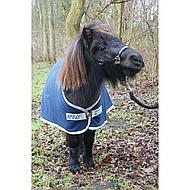 The Amigo Petite line is specially made for mini horses. This cooler effectively transports moisture but also keeps the pony warm. The blanket has a single hook / eye chest closure and an invisible belly girth. The blanket suitable as sweat, transport, stable and show blanket. Fits perfectly with the matching Amigo accessories.